Pride’s Jazzy Select Elite “in-line technology” provides stability and a tight turning radius. The high-back seat with headrest and larger footplate will keep you riding in comfort all day. 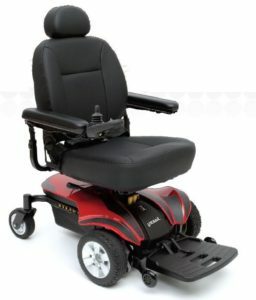 The easy to maintain design and added Jazzy Armor makes this power chair reliable and more resistant to normal wear and tear than other power wheelchairs. The charging port is easily accessible on the controller.The Jazzy Select Elite delivers a potent blend of power, performance and style. The excellent stability and maneuverability allows this chair to have a solid performance indoors and out! 35″ Unit Weight: 105 lbs.